Sind Sie mit der Geschwindigkeit Ihrer Datenanlyse unzufrieden? Oder haben Ihre Dashboards lange Ladezeiten? Dann können Sie bzw. Ihr Datenbank-Administrator folgenden Hinweisen nachgehen, die sich je nach Datenquelle unterscheiden können. Benutzen Sie mehrere »kleinere« Datenquellen für individuelle Fragestellungen anstatt einer einzigen Datenquelle, die alle Fragestellungen abdecken soll. Verzichten Sie auf nicht notwendige Verknüpfungen. 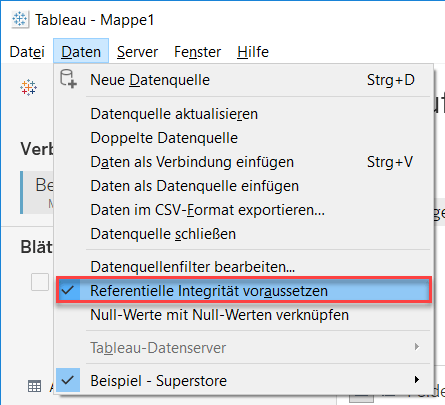 Aktivieren Sie in Tableau die Option »Referentielle Integrität voraussetzen« im »Daten«-Menü (siehe Abbildung 2.20). 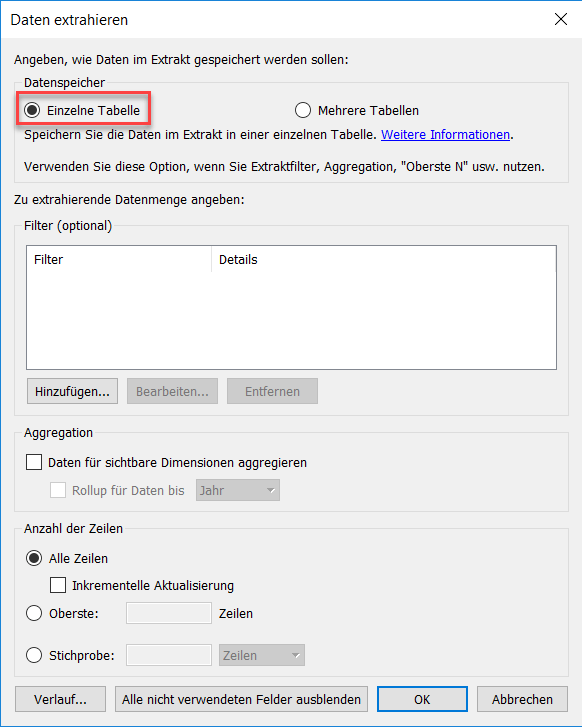 Wenn Sie diese Option verwenden, schließt Tableau die verknüpften Tabellen nur dann in die Datenabfrage ein, wenn sie explizit in der Ansicht verwendet wird*. Wenn Ihre Daten nicht über referentielle Integrität verfügen, sind die Abfrageergebnisse möglicherweise ungenau. * So wird beispielsweise der Umsatz anstatt mit der SQL-Abfrage SELECT SUM([Sales Amount]) FROM [Sales] S INNER JOIN [Product Catalog] P ON S.ProductID = P.ProductID lediglich mit der SQL-Abfrage SELECT SUM([Sales Amount]) FROM [Sales] ermittelt. Verzichten Sie auf Vereinigungen über viele Dateien hinweg, da deren Verarbeitung sehr zeitintensiv ist. Nutzen Sie einen Datenextrakt anstatt einer Live-Verbindung, falls Sie nicht mit einem schnellen Datenbanksystem arbeiten (siehe Wann sollten Sie Datenextrakte und wann Live-Verbindungen verwenden). Stellen Sie sicher, dass Sie beim Erstellen des Extrakts die Option »Einzelne Tabelle« wählen, anstatt der Option »Mehrere Tabellen« (siehe Abbildung 2.21). Dadurch wird das erzeugte Extrakt zwar größer und das Erstellen des Extrakts dauert länger, das Abfragen hingegen wird um ein Vielfaches beschleunigt. Definieren Sie für Ihre Datenbank-Tabellen sinnvolle Index-Spalten. Legen Sie für Ihre Datenbank-Tabellen Partitionen an. How can a Tableau dashboard that displays contacts (name & company) automatically lookup LinkedIn profile URLs? 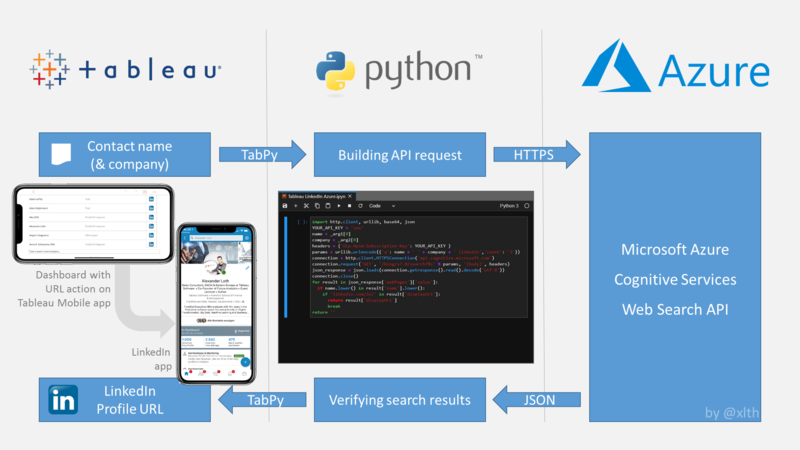 We use Python to build API requests, communicate with Azure Cognitive Services and to verify the returned search results. In order to use Python within Tableau, we need to setup TabPy. If you haven’t done this yet: checkout my TabPy tutorial. One of many APIs provided by Azure Cognitive Services is the Web Search API. We use this API to search for name + company + “linkedin”. The first three results are then validated by our Python script. One of the results should contain the corresponding LinkedIn profile. Adding a URL action with our new Calculated Field will do the trick. Now you can click on the LinkedIn icon and a new browser tab (or the LinkedIn app if installed) opens. For my birthday this year, I’m asking for donations to Alzheimer’s Association. I’ve chosen this nonprofit because their mission means a lot to me, and I hope you’ll consider contributing as a way to celebrate with me. Every little bit will help me reach my goal. The panel discussion “The empathy machine: are digital technologies the best bet in telling about your cause?” took place on the opening day of the 2018 Fundamental Rights Forum (FRA). This forum was organized by the European Union Agency for Fundamental Rights, and took place at the METAStadt Vienna 25-27 September 2018. In this panel discussion Kadri Kõusaar (a Oscar nominated film director), Fanny Hidvegi (European Policy Manager) and me discussed if digital technologies really are the “empathy machine” and how innovative applications can help human rights defenders to achieve some challenging goals such as a change in public attitudes or meeting tough fund-raising targets. The panel discussion was moderated by the virtual reality artist Dr. Frederick Baker. 1. How do algorithms interfere with human rights? When algorithms make certain decisions, these algorithms tent to mirror what they are shown with training sets. This is especially apparent for issues such as bias and machine discrimination. Both might be the result of the content of the training data, which reflects existing inequalities. 2. So, it’s about the data? What else makes data so important today? The effective use of data is vital for our understanding of fundamental issues, such as human rights violations and political instability, for informing our policy-making, and for enhancing our ability to predict the next crisis. Furthermore, the scope, complexity and life-changing importance of the work being done on topics like these across the European Union has made it more important than ever for everyone participating in the public conversation and in demographic decision-making to have access to and to be able to derive insights from key data sources. 3. Where is data coming from and how can people benefit? Every time we google something, send a tweet, or just browse a website, we create data. With the rise of visual analytics we can benefit from this vast amount of information. Visual analytics is a hands-on approach to interacting with data that does not require any programming skills. Furthermore, communicating with data, is seen as one of the most relevant skills in today’s information age. 4. What is the easiest way to find interesting data? I would check out the Google’s new search engine for datasets that was just released recently! Tableau Public is a good source for existings visualizations. Many of these are based on public data. 5. What is required to enable organizations to use data for good? Data can be used for the good of society, but private- and public-sector firms, nonprofits and NGOs still lack analytics resources and expertise. Data and analytics leaders must cross traditional boundaries to use data for good, to better compete for limited talent, and to foster an ethical culture. VizForSocialGood and Tableau Foundation are good examples. 6. How can the private sector contribute for good? 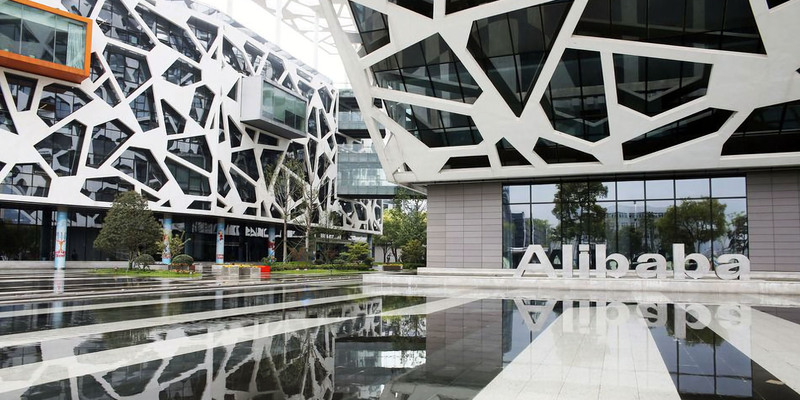 Mastercard anonymizing credit card data to be analyzed in smart city initiatives. Google making search data available to hospitals to predict infection disease outbreaks such as flu and dengue fever. Insurance companies providing anonymized healthcare data to improve patient outcomes and prevention strategies. Yelp providing ratings data to cities to prioritize food safety inspectors. 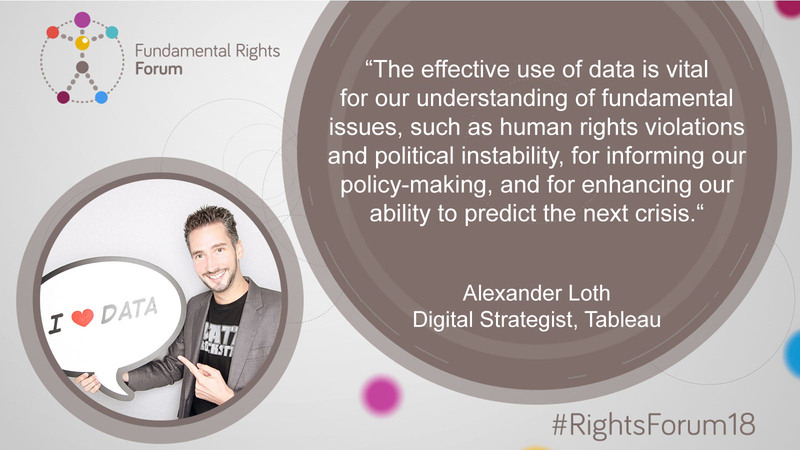 Author Alexander LothPosted on December 12, 2018 December 13, 2018 Categories Blog, Digital Strategy, Economics, Information ScienceTags Data Strategy, Data Visualization, Digital Transformation, EU, Panel, Public Sector, Tableau, UNHCR, WorkshopLeave a comment on The Empathy Machine: Are Digital Technologies the Best Bet in Telling about your Cause?